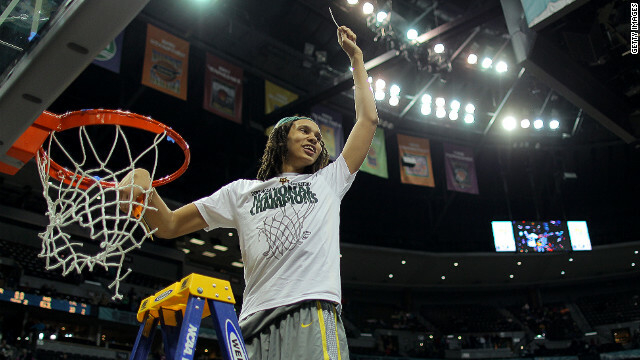 Baylor's Brittney Griner cuts down the net after the Lady Bears thrashed Notre Dame 80-61 on Tuesday night. If she hadn't made the point already that she and the Baylor Lady Bears were the queens of women's hoops, Brittney Griner left no doubts Tuesday night. With their 80-61 win over Notre Dame, the Bears did the unprecedented, winning 40 straight games in a season and planting themselves firmly in the debate over which is the best women's college team ever. In a game that was close before the Bears shredded the Fighting Irish 46-33 in the second half, Griner filled the stat sheet as she's done all season. Playing all but one minute, the Naismith Trophy winner tallied 26 points, 13 boards and five blocks. Oh, and she tossed in an assist for good measure. Her shooting percentage in the second half? A lights-out 89%. While all the talk after the men's championship revolved around the next level - who's going to the pros, who's staying for another year - Griner, a junior, has insisted she will forgo making upwards of $1 million, a fortune in women's hoops, to play for the Lady Bears her senior season. Yes, even if Baylor won the championship game, she has said. The Lady Bears' performance made them only the 10th women's team to run the table since 1972, when the tournament era began. Now, undefeated seasons in women's hoops aren't the shooting stars they are in the men's game. The Connecticut Huskies' women's team went 39-0 in 2002, 2009 and 2010, whereas the last men's team to run the table was the 1976 Indiana Hoosiers. Coach Kim Mulkey, who never sat during the game despite battling Bell's palsy over the last week, said she couldn't have been prouder of her squad. "I just hugged them and told them, 'I'm so happy for you guys. Thank you for letting me coach you. Thank you for letting me challenge you,' " Mulkey said, according to the Houston Chronicle. "I said it to all of them. There were many tears on that bench, but they were tears of joy." She had the highest of praise for her star center, the paper reported. "Brittney Griner may go down in history as the most dominant post player, especially on the defensive end," Mulkey said. "That child comes to work every day." The 6-foot-8 Griner has been breaking the mold of the female player for years - like the time she posted a quadruple-double (36 points, 15 rebounds, 15 blocks and 10 assists) during a high school game, or when she put down 52 dunks during her senior season in high school, or when she dunked four times as a freshman at Baylor, or when she tallied 23 points a game during her sophomore and junior seasons, or when she became the second woman to dunk during an NCAA Tournament in last month's game against the Florida Gators. There has even been talk that she could hang with the big boys in the NBA - though I'll stop right there so as not to rile up the clowns on Twitter who can't get over the fact that she's tall. - She has an 84-inch wingspan and her standing one-arm reach is 110 inches, only 10 inches shy of the rim. - She wears a men's size 17 shoe. To put it in perspective, Shaquille O'Neal wears a 22. - Despite the praise heaped upon her, Griner remains largely humble, brushing off notions that she is revolutionizing the game. At the same time, she is a true showwoman and puts on dunking clinics during pregame warmups, to the crowd's delight. She's even done cartwheels across the field at Baylor football games. - One of four siblings, she was born in Houston, Texas, on October 18, 1990, and played at Nimitz High School in Houston, so she's been playing in East Texas for a minute. - She set a block record at Nimitz, once registering 25 in a game against Aleif Hastings High. - Her high school jersey is one of 25 in the Women's Basketball Hall of Fame's Ring of Honor. - She made the cover of ESPN's Rise magazine in December 2008 and the cover of Slam in February 2009. - Houston Mayor Bill White declared May 7, 2009, as Brittney Griner Day. - Baylor has a 101-13 record since she joined the team and has advanced to at least the NCAA Tournament's Elite Eight in all three of Griner's seasons. - She is a general studies major with an emphasis in outdoor recreation. - Griner is ranked first and third in blocks during an NCAA season. This year, she had 175, while on the men's side, the Kentucky Wildcats' shot blocker extraordinaire, Anthony Davis, had 186. - She was the first female athlete to be evaluated in-studio for ESPN's "Sports Science." - On March 3, 2010, she was ejected from a game against Texas Tech after punching Jordan Barncastle in the face following a scuffle under the rim. The punch broke Barncastle's nose. - She is a finalist for the 2012 U.S. Olympic team that will play in London this summer. As the only college player on the team for its European Tour last year, she averaged almost 13 points and eight rebounds. She was the team's top shot blocker as well. Surprise, surprise. - She is often seen riding a longboard around campus. She once described herself to the Chronicle as a "humongous kid" and said, "I do lots of stuff besides basketball. I'm an outdoors person. I go kayaking. I like to go mountain biking down hills, longboarding. I'm adventurous … maybe reckless. I'm a thrill seeker." - She also enjoys working on cars and watching football in her spare time. - A frequent speaker at local schools, she volunteers her time with the Salvation Army, Waco Zoo, Waco's Gospel Cafe, South Waco Recreation Center and Woodway Family Center. She also chips in with former Houston Rockets guard Steve Francis, who hosts an annual Holiday Bowling and Christmas Party for underprivileged children. Filed under: Basketball • College basketball • Sports • Texas • U.S.
Sha just signed a multiyear contract to star in the 3 Predator movies...as the Predator. Get off the board if you can't add something positive. Baylor and Brittney are fine champions. Even though I laughed at the predator comment- you need to stop being a hater! The funny thing is–she could do it. This is one hell of a player if people have to pick apart her per her looks try to imagine what these accussing people look like! You would be frightened! Keep up the ki#k as- britteny griner! Okay, we realize "she's" a freak. But has anyone said "she's" passed the real test? The Baylor Bears are freaking AWESOME! I go to Baylor and the girls deserve everything they get, so those of you who dont like it all i can say is GET OVER IT! She truly did make history this year. She became the first man to ever win a Women's National basketball championship. Impressive. there are 21 UConn basketball players that have better career stats than griner..
That is a DUDE. Seriously, just because someone puts a bow in the hair and paints their nails, does not mean they are female. Someone needs to do a index finger check. College seasons used to involve 20+ games, including post-season. It's gotten so commercial the players should be paid. She's a man. I'm sorry that this has to happen to her and other women, but there is no doubt she is an XXY. Women should not be playing against men, it's unfair. I totally agree. I'm confident that if she were tested, she would be diagnosed with Klinefelter's syndrome and thus be a man. Just listen to her voice... She's a man baby, yeah. If they could get half a dozen women of that caliber in the WNBA, they could up the game a notch, with more dunks, etc. and I think the media interest and salaries would go up. Congrats Lady Bears! Brittney Griner is the best FEMALE basketball player I have ever seen play this game. SHE is amazing on the court and off. If all these people saying all this negative stuff knew HER they wouldn't be saying stuff like this. Remember people SHE is someones child no matter how old SHE is, also there is that thing called bullying and this falls under that category. So stop hating on HER and encourage HER. Love you B, keep playing your game. Nice post. I used to be checking constantly this blog and I'm inspired! Extremely useful info specially the closing phase 🙂 I maintain such info much. I was seeking this certain info for a long time. Thanks and best of luck.